about 30 sea miles west of the northwestern tip of Vancouver Island. Forbidding cliffs buttress a rain-swept plateau of hairgrass, salal and salmonberry. In 1910, a lighthouse was built there, at an altitude of 210 metres. A gale carried off the lightkeeper’s dog, and the lighthouse closed down in 1920. When the beacon wasn’t hidden in thick fog, it was being lashed by hurricane-force winds, so the lighthouse was pointless. If you were close enough to see the Triangle Island lighthouse in weather like that, it meant you were going to die. 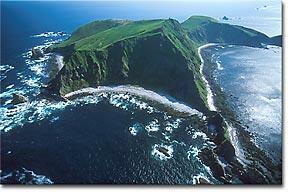 Triangle Island is one of the North Pacific’s most important seabird rookeries. Half the world’s Cassin’s auklets roost there. When the island suddenly erupts in Cassin’s auklets, and becomes obscured by clouds of tufted puffins and Rhinoceros auklets, it is like some great crescendo in an ancient orchestral arrangement that oceanographers, climatologists, ornithologists and fisheries biologists were only just beginning to piece together during the final years of the 20th century. When they looked closely at the patterns in the vast ecological data sets they’d accumulated, what all those scientists saw was a kind of sheet music. It was emerging from records of sardine catches that the Chibo prefecture’s official diarists maintained from the late 1500s on the Japanese Island of Honshu. It was coming from fluctuations in anchovy abundances down through the ages, divined by analysis of sediment samples from the seafloor in the Santa Barbara Channel. It came from the close scrutiny of tree-ring widths in coastal bristlecone pine trees, and from the discovery of variations over the centuries in marine-derived nitrogen in lake sediments in Alaska, and the intensity of the Aleutian Low Pressure Index, Russian records of fur seal harvests, British Columbia’s halibut landings, and on and on. We’d just come to a moment in human history when we were beginning to hear that strange and ancient music. We were just beginning to discern the syncopation and modulation of sea surface temperatures, the nuanced phrasing in wind rhythms, the adaggio of phytoplankton and zooplankton densities, and the fortissimo of seabird abundances. If it is music, then the string section is falling suddenly silent. The woodwinds are in discord. A kind of madness has taken hold of the percussions. The place Triangle Island occupied in the old music is a precise point between the movements of a great aria. The West Wind Drift arises from several gyres that move in great arcs through time and space, and it is at Triangle Island that those voices cleave into two great choruses. One sweeps north through the Coastal Downwelling Domain, becoming an ever-spinning circle around the Alaskan Gyre. The other turns south, through the Coastal Upwelling Domain, and becomes the California Current. During the final 25 years of the 20th century, a great dissonance was first heard in global climate patterns. At Triangle Island, it was only barely detectable, a mere 0.9-degree rise in sea surface temperatures, but that was enough to shift the arrival of “spring” by several days. It was hard on the Rhinoceros auklets. It meant death for any tufted puffins that still hatched from their eggs in time with the old music. By 2004, new and different sounds were coming out of the North Pacific. A southern species of zooplankton was blooming around Triangle Island. An exotic Atlantic zooplankton showed up, and so did thousands of Humboldt squid, a creature more common to the coast of Chile, rare off California, and never seen north of Oregon before 1997. Hake were swimming as far north as the waters beyond the Queen Charlotte Islands. Off Vancouver Island’s west coast, shrimp populations disappeared. The Fraser River’s sockeye runs collapsed. The broken rhythm of the ocean’s climate patterns was now upon the land. In 2003, spruce beetles had devoured 95 per cent of the spruce forests on Alaska’s Kenai peninsula, covering an area twice the size of Yellowstone Park. There were bark beetles and pine beetles, and in British Columbia they swept through an area the size of England, and jumped the northern Rockies. The continent’s great northern boreal forests lay before them. Beetles were eating forests as far away as Wyoming and New Mexico. Southern California burst into flames. Puccini gave way to Wagner, and Wagner gave way to noise, and in the springtime of 2005, back on those forbidding cliff faces 30 sea miles west of the northwestern tip of Vancouver Island, an adult population of 500,000 Cassin’s auklets was settling down to roost. Most of the birds failed to lay eggs. The eggs they did lay failed to hatch. Those that hatched died. You could say the stars were blinking out in the night sky, or you could say the music stopped. But the seas were erupting in a sudden fury, just when we were close enough to make out the lighthouse at Triangle Island. Brilliant, haunting, and frightening but achingly beautifully written at the same time. Thanks for this.